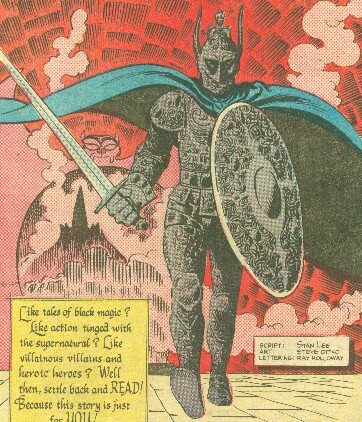 Powers/Abilities: The Black Knight was a suit of armor animated by Merlin's magic. It was skilled at horsemanship, swordsmanship, and jousting. By its very nature it was immune to conventional injury. 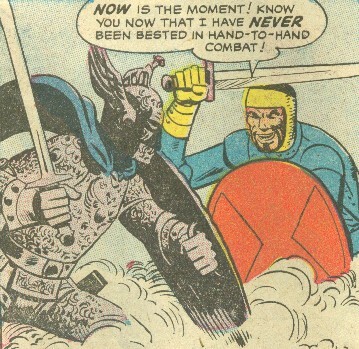 (Strange Tales I#108) - Sir Mogard, one of the Knights of the Round Table, became jealous of Merlin, advisor to King Arthur Pendragon. He confronted Merlin, calling him a fraud and challenging him to select a warrior as his champion so that Mogard could defeat him in battle. The next day, Merlin appeared at the joust with his mysterious Black Knight. The Knight quickly unhorsed Mogard with his lance, and then just as quickly struck his sword from his hand with his own sword. Mogard yielded, but insisted that Merlin was still a fraud, as he had nothing to do with the abilities of the warrior Knight. Merlin then revealed his power to Mogard by showing him that he had been bested by an empty suit of armor, which Merlin then allowed to fall apart. Comments: Created by Stan "The Man" Lee and "Sturdy" Steve Ditko. It has been hypothesized that Merlin created this Black Knight prior to Sir Percy adopting the role. One might then extrapolate that Merlin might have used this Black Knight on other missions prior to Sir Percy's arrival in Camelot. 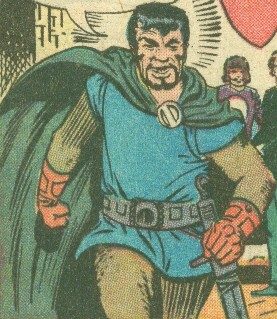 This story was identified as Merlin's first appearance in the modern era in the Official Handbook of the Marvel Universe, but one of the Official Marvel Indexes identified the story as non-continuity. There is nothing to rule it out, and it conflicts with nothing, so I say leave it in. The other Knights in this story are unidentified, but they could easily have been Lancelot or any of the other better known Knights of the Round Table. Thanks to David A. Zuckerman for a small correction. One of the Knights of the Round Table, he became jealous of Merlin, advisor to King Arthur. He confronted Merlin, calling him a fraud and challenging him to select a warrior as his champion so that Mogard could defeat him in battle. The next day, Merlin appeared at the joust with his mysterious Black Knight. The Knight quickly unhorsed Mogard with his lance, and then just as quickly struck his sword from his hand with his own sword. Mogard yielded, but insisted that Merlin was still a fraud, as he had nothing to do with the abilities of the warrior Knight. Merlin then revealed his power to Mogard by showing him that he had been bested by an empty suit of armor, which Merlin then allowed to fall apart. Legend has it that Mogard never again uttered another word for the rest of his days! For the jealous knight was struck dumb by the wonders he beheld--the wonder of Merlin's magic.